3 Stage sharpening for perfect results every time - Prepare, Sharpen, then Hone. Ergonomic comfort handle for maximum grip - suitable for both right and left handed users. Heavy duty non-slip rubber base for ultimate grip & safety - any flat surface in your kitchen will do (no need to find a suitable clean surface, unlike sharpeners with suction cup designs). Incredibly easy to use, full instructions provided. The Smart Sharp Knife Sharpener - Perfectly Sharpened Knives Every Time. Bring Your Blunt Knives Back to Their Best. Kitchen knives long past their best? Blunt blades making a chore of chopping? Does your old sharpener fall way short of sharp? 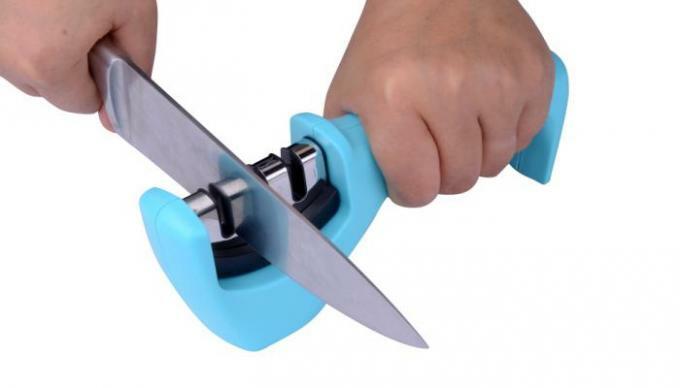 This ingenious 3 stage pull-through knife sharpener will restore your dull old kitchen knives back to their former 'just-bought' sharpness in no time. Stage 1 - Preparation (High grade Diamond rods). This 'roughens' the knife edge to prepare the surface for sharpening. It also smooths any nicks and imperfections that could cause the blade to 'catch' during the sharpening stage (a common problem with lesser 1 and 2 stage pull through sharpeners which can cause damage to blades). Stage 2 - Sharpen (Hardened Tungsten Carbide Plates) - Now pull the blade through slot 2's precision angled tungsten carbide plates to create the perfect sharpened 'V' edge on even the bluntest knife. Stage 3 - Hone (Ceramic Stone Rods) - For final edge honing. It removes any burs and gently polishes the blade edges for a razor sharp finish. 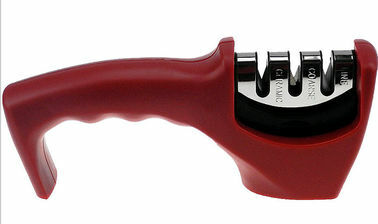 Please note: This is a precision tool, designed specifically for use with straight edged steel knives and wide serrated knives (bread knives) only. Not suitable for scissors, micro-serrated knives and ceramic knives. We also recommend that the Smart Sharp is not used on specialist Japanese knives, including the knife brand 'Global' - this is due to the much narrower blade angles of these knives. 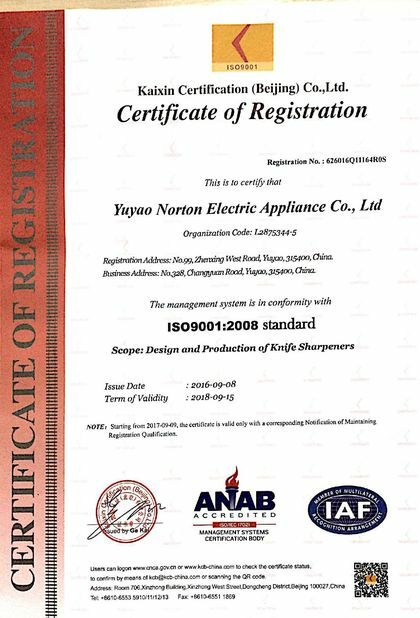 Knife sharpener Production and export are Norton’s main services. We offer customized kitchen accessory knife sharpener production to suit the needs of our customers.